Last summer marked the end of my 5-year tenure on the University of Colorado Design Review Board. It has been a fascinating journey with talented colleagues. On a monthly basis, we had the chance to explore the role that architecture and landscape has to define the identity of each of the campuses and shape their future while understanding the past and present. During that time we met monthly to review all buildings, landscapes, and master plans for the four campuses of the University: Boulder, Denver, Anschutz Medical Campus and Colorado Springs. I had the chance to review several billions of dollars of project and a wide range of types from major additions to the stadium in Boulder, a sports field on a parking garage at UCCS, student housing, lab and research buildings, a new Recycling Center, performing arts center, monument signage, dining halls, administrative buildings, bridges, and just about everything in between! I feel honored to have had the chance to touch and influence such a diversity of projects and by so doing contribute to the conversation about the nature of each of these campuses. It was also a chance to explore the nature of Design Review: what is its role? How to make it effective in the context of talented staff and design teams? How to balance review with schedule and budget concerns and influence the outcome in a way that is effective and positive? Each campus has a very different identity and these questions varied for each project but I also observed a few common themes. Boulder, as the oldest “flagship campus” represents historical continuity and the key concern on the main campus is how and where to honor the beauty of the traditional campus. New buildings on the core campus though have very different responsibilities than those built on the east campus or Williams Village. A dilemma for building on the main campus is the relationship between the historic Klauder architecture and the new buildings given especially the difference in scale. New campus buildings are much bigger and more specialized than those built in the time of Klauder. In the early days of the campus there were academic, residential, and recreational buildings with little differentiation beyond this. Indeed some of the best spaces were the courtyards framed by colonnades and simple small-scale buildings. Now of course there are highly specific lab buildings, LEED Gold requirements, large multi-venue dining centers, and projects at a significantly larger scale than ever anticipated. The Center for Community is much larger than the older buildings but replicates materials, details, and form of the smaller buildings. Most new buildings on the campus still use the traditional sandstone, copper gutters, stone copings, and tile roofs but selectively new materials have been introduced to place the buildings in a contemporary context. Is that honoring Klauder? How can the new buildings be “of their time and place”, reflect new progressive values of open-ness and interdisciplinary learning, be built for a 100 year time-frame, support cutting edge sustainable strategies yet still respect the historic campus? Should every building be equally respectful of the past? We grappled with these questions on each project on the main campus and arrived at different answers depending on the program, context, and design intent. Another difficult challenge is the scale of the new buildings. The most charming aspect of the old campus to me is the interconnected public realm – the courtyards, walkways, and plazas that have been very difficult to reproduce with the large new buildings. Some projects have tried some innovative approaches to address this but this remains one of the more problematic aspects on the main campus. Each new building addresses these questions in a unique way but I believe a more intentional strategy could help the urban design and architectural language of the main campus move more gracefully into the future. I also believe that it is not enough to just paste the original details on these new large specialized buildings. It is time for a re-consideration about how to honor context but address the differences between these very different conditions. While some buildings have tried a gentle re-consideration like the new Art Building others have lost the scale and complexity of the main campus. The East Campus provides a unique opportunity to strike out in a new direction from the historic main campus. Given the fact than many of the new buildings will be large-scale technical buildings like the new Aerospace Engineering Building, there is an imperative to define the architecture and public realm in a new way while defining the setting to be uniquely “CU Boulder”. The character of the public spaces and quads, the mix of uses, the building form and materiality and the relationship to nature can be defined in a contemporary way that celebrates the advances in new ways of thinking about these issues especially around the issues of sustainability. This can give the East Campus a new identity where innovation and cutting edge research is celebrated and made more evident. It will be exciting to see how this emerges. 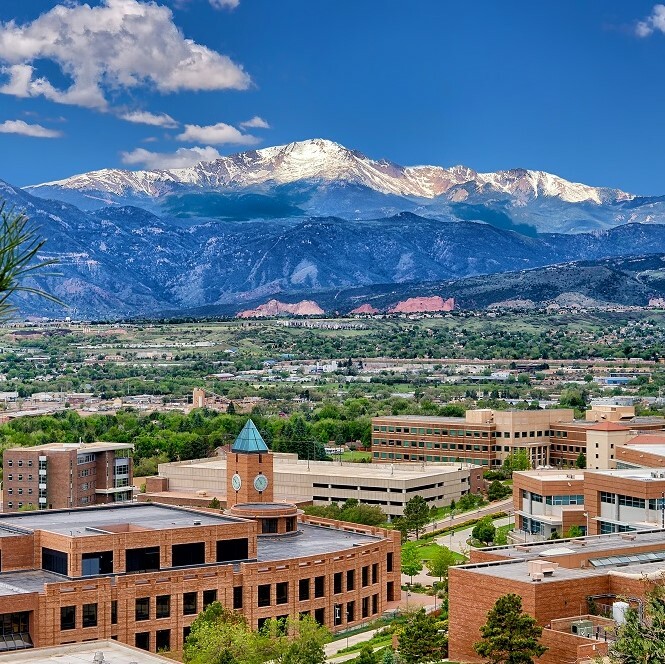 In contrast to CU Boulder, the campus in Colorado Springs has a stronger connection to the natural world and a much more contemporary architectural heritage. The sites are marked by extreme grade changes and near and far views of the mountains including the iconic Pikes Peak. The new Ent Center for Performing Arts demonstrates an approach to creating a very contemporary architectural approach as a unique “foreground building” while the new Hybl Sports Medicine and Performance Center demonstrates an approach to respecting the campus vernacular in an unflinchingly contemporary way. Without an older campus building tradition like Boulder, the new campus architecture can create a distinct identity and sense of place that respects the landscape and reflects the entrepreneurial and innovative spirit that defines UCCS. The challenge is how to address the car-oriented context and the fact that the campus is so spread out. While the spine organizes the central campus, given the entire campus scale, pedestrian connection ares harder to achieve especially between the buildings. New forms of mobility, bike sharing, extending the spine, transit, etc will have a big impact on the relationship between buildings, their access and entries, and how they address the site. Another question is how to move the materiality and the architectural language of the older buildings - given their more recent pedigree - into a more contemporary approach. It is not in the campus’ benefit to freeze this style or to make it too precious. Anschutz is different again forging an academic environment in an area dominated by large hospitals and research campuses. Right sizing and activating the public spaces given the large building sizes creating both architectural continuity and individual identity will be unique challenges. CU Denver has its own challenges with forging an identity out of the Auraria campus as the concept of neighborhoods on that campus continues to evolve. How does CU Denver forge a distinct architectural vocabulary from the other institutions and have a well defined public realm belonging to CU? New opportunities are emerging at the west end of campus so the idea of “CU in the City” can be re-considered in the context of the evolving city. The architectural language and character of this evolving campus will give this most urban campus of the CU system a unique character. It is moving beyond the business park pedigree of the Auraria campus to stake out a new CU identity. The Design Review Board tackled these broad concerns at all the campuses. As is evident, each campus has very different questions and issues. But I think there is a common thread in terms of both design review process and the resultant buildings throughout the CU system that is independent of the campus. On a future blog I will look at the design review process and its pros and cons from this experience and my 18 years of design review at the Belmar Development in Lakewood (the Architectural Control Committee). I will conclude this post though with some ideas about common principles for building on all the CU campuses. What make a CU Building? A classic definition of architectural quality is “a building is of its time and place”. This is a good place to start to define quality for the buildings of CU whether a music building on the historic CU Campus or a new cutting edge lab building at the Anschutz Medical Center. The buildings should contribute to the legacy of the campus by both fitting in but being memorable and delightful in some way; this includes understanding their role as foreground or background buildings. They need to contribute to an exquisite public realm by understanding and contributing to the urban design of each campus: scale, relationship, connections, and the making of public spaces. Given the outstanding climate of Colorado, each building can foster a relationship between inside and outside and contribute to the making of great outdoor spaces. Sustainability should be fundamental to the design approach to demonstrate a commitment to an environmental legacy as well. Similarly accessibility should be central to the approach. And it is important that each project be built to last for 100 years; the most sustainable approach is one of longevity. On this note, striving for a “looser fit” between the design and use is desirable to allow the buildings to evolve over time. This is especially difficult with specialized lab or residential buildings but a thought towards how the building might function with a different use is a useful consideration. I think the buildings should also reflect the values of the University of Colorado: open-ness, innovation, diversity, respect, and excellence. To that end, I think it is essential to be both respectful of a campus tradition and confident enough to move that tradition forward with new emerging ideas. This makes a balance between “time and place”, honoring the past, expressing the present and designing for the future. That can continue to help define the unique campuses of CU and foster a culture and expectation of design excellence for the built environment. More discussion is needed to explore the principles that define excellence but hopefully this adds to that conversation.